1978-1985 BA and MA in sculpture, MS University, Baroda. 1977 BA in Economics, English and Psychology, Bangalore University. 2007 Paris Autumn and Rashtriy Kheer, Gallery Chemould and MPCVA, Mumbai. Streetside Theatre, Bharat Rang Mahotsav, National School of Drama, Delhi. Streetside Theatre, Szene- Salzburg Festival, Austria. Paris Autumn and Rashtriy Kheer, Gallery Sumukha, Bangalore. Paris Autumn and Rashtriy Kheer, Gallery Chemould, Bangalore. 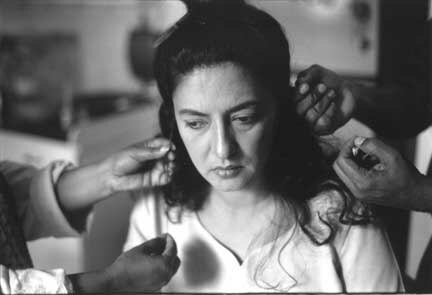 2006 Pushpamala N. Photo Performance work, Nature Morte, New Delhi, Bose Pacia , New York and Spazio Piazza Sempione, Milan. Pushpamala N. Photo and Video Performance work, Espace Croise, Roubaix. Paris Autumn, Video and Photo installation, Galerie Zurcher, Paris. Native Women of South India, Bose Pacia Gallery, New York. 2005 Native Women of South India, Nature Morte, New Delhi. 2004 Native Women of South India- Manners and Customs, collaborative project with Clare Arni, Sumukha Gallery, Bangalore, Gallery Chemould , Mumbai and Seagull Arts and Media Center, Kolkata. Indian Lady, Photo and Video Performance work, Bose Pacia, New York. 2003 Phantom Lady and Sunhere Sapne, Walsh Gallery, Chicago. The Anguished Heart, Nature Morte and Gallery Chemould, British Council, Delhi. 2002 Golden Dreams, Gallery Sumukha, Bangalore. 1998 Phantom Lady or Kismet: A Photo Romance, Gallery Chemould, Mumbai, and the artist`s studio, Bangalore. 1994 Excavations, sculpture show, Gallery Chemould, Mumbai. 1983 Sculpture show, Venkatappa Art Gallery, Bangalore. 2006 Changing Skin, Gallery SKE, Bangalore. Indian Express, Helsinki City Art Museum, Finland Fiction @ Love, Shanghai. Ultra New Vision of Contemporary Art, Singapore Art Museum. Another Asia, Noorderlicht Photofestival, Netherlands. Indian Video Art : Between Myth and History, part of Cinema Prayoga: Indian Experimental Film and Video 1913- 2006, Tate Modern, London. 2005 I, Me, Myself , Kashi Art Gallery, Cochin. Are We Like This Only, Vadehra Gallery , Delhi. Indian Summer, the École Nationale Supérieure des Beaux-arts, Paris. Edge of Desire, Asian Society, New York and Museo Tamayo, Mexico. Yokohama Triennale, Open Circle , Japan. Kovideo, 1st Durban Video Festival, South Africa. 2004 Iconography in Transient Times, Gallery Sumukha, Delhi. Edge of Desire, Art Gallery of Western Australia, Perth. 2003 Heat a Picture Show, Bose Pacia Modern, New York and City Park, Dublin, Ireland. DiVerge, 40 Years of Chemould, NGMA, Mumbai. 2002 New Indian Art: Home, Street, Shrine, Bazaar, Museum; Manchester City Galleries. Ways of Resisting, SAHMAT, New Delhi. 2001 Century City, Tate Modern, London. Moving Ideas, Montreal and Vancouver. 1999 Art from India, Patricia Correia Gallery, Los Angeles Biennale. 1998 The Presence of the Past, NCPA, Mumbai. 1997 Telling Tales, Bath Festival Trust, UK. Telling Times, British Council, New Delhi. 1996 The New South, London. Fire and Life, Australia India Art Project, Mumbai and Perth. Shilpayan, Contemporary Indian Sculpture, NGMA, New Delhi. 1995 Dispossession, Africus, 1st Johannesburg Biennale. 100 Years of NGMA, National Gallery of Modern Art, New Delhi. Recent Trends in Contemporary Indian Art, Vadehra Art Gallery, New Delhi. Sculpture 95, Gallery Espace, New Delhi. 1994 Still Life, Sakshi Gallery, Mumbai. 1992 2nd International Women`s Festival, Bangkok. A Nest for Sparrow, Mumbai. 1990-91 Pushpamala N. and Alex Mathew, Venkatappa Art Gallery, Bangalore, CMC Gallery, New Delhi and Chemould Gallery, Mumbai. 1989 Timeless Art, VT Station, Mumbai. Artist`s Alert, SAHMAT, New Delhi. 1987 The Sculpted Image, Bombay Arts Festival, Mumbai. 1986 VI Triennale-India, New Delhi. 1985 Pushpamala N, Atul Dodiya and Akitham Vasudevan, Gallery 7, Mumbai. Seven Young Sculptors, Kasauli Art Centre, New Delhi. 1998 Karnataka Shilpa Kala Akademi Award. 1988 Silver Jubilee Award, Karnataka Lalit Kala Akademi. 1986 Gold Medal, VI Triennale, India and Karnataka Rajyothsava Award. 2006 The Rockefeller Foundation artist residency, Bellagio Study Center, Italy. French Embassy SCAC artist residency, Paris. 2000 Indian Foundation for the Arts, Arts Collaboration Grant. 1999 Curated and organized an exhibition of large public site- specific works, Sthala Puranagalu [Place Legends], Bangalore. 1998 Khoj International Workshop, Modinagar. 1992-93 Charles Wallace Trust (India) Fellowship residency, London. 1985 Artist`s Camp, Bharat Bhavan, Bhopal. 1978-85 Karnataka Lalit Kala Akademi Art Scholarship. 1975-77 Bangalore University English Scholarship.